We feel tremendous excitement for all that’s happening at UUMC right now, and it’s our hope that you will, too. We offer opportunities to deepen your spiritual life, connect with others, engage your passions and talents, and help bring justice and healing to the wider world. We will join with Christians all over the world in waving palms and singing to remember Jesus’ entry into Jerusalem. All children are invited to participate in the palm processional. Our District Superintendent, Rev. Teresa Welborn will be our guest preacher. The English word "Maundy" comes from the Latin mandatum, which means "commandment." As recorded in John's gospel, on his last night before his betrayal and arrest, Jesus washed the feet of his disciples and then gave them a new commandment to love one another as he had loved them (John 13:34). Our service will include communion. This service of Tenebrae or darkness includes music and readings reminding us of Jesus' arrest, trial and death. This service prepares our minds and hearts for the day of resurrection. University UMC has been a member of the Reconciling Ministries Network since January, 2010. As a Reconciling congregation, we believe all persons are created in the image of God, and worthy of God’s love and grace. We celebrate our diversity and recognize the sacred worth and dignity of all persons without regard to gender, race, age, sexual orientation, ethnicity, physical or mental capacity, education or economic or marital status. 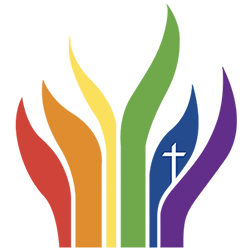 We welcome all who have known the pain of exclusion or discrimination in the church and society, and we invite all people to join us in our faith journey toward greater love, understanding, and mutual respect. If you're looking for ways to deepen your spiritual life, come join us for worship. If you're looking for a place to connect and grow, come join us in one of our many classes or find a group of people who share common interests and grow in faith together. If you're passionate about the works we do here and are moved to give, please do so, and trust that it is greatly appreciated and we will put it to good use.